Need to register a kit? Why should I choose Sema4 Expanded Carrier Screen? If you are pregnant or planning for pregnancy, our Expanded Carrier Screen is designed to give you a comprehensive and accurate understanding of your risk of passing a genetic condition onto your child. With a simple blood or saliva test, find out if you and your partner are carriers of genetic variants (or changes) that could affect your children. 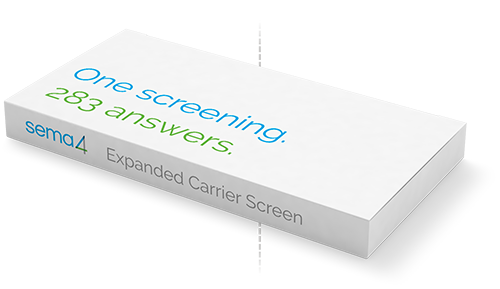 Sema4 Expanded Carrier Screen is a comprehensive carrier screen for more than 280 inherited diseases to give you the information you need to plan for a healthier future for your family. When assessing your risk, precision matters. Our Expanded Carrier Screen uses advanced sequencing technologies for results that are >95% accurate. To get started, talk to your doctor about requesting the screen. Print out this requisition form to share with your doctor. Your doctor takes a single blood draw or saliva sample and sends it to our lab. Your sample is analyzed by our state-of-the-art sequencing technologies. This usually takes about 2 weeks. Once your genetic screen is completed, a genetic counselor may contact you to explain your results and answer any questions you might have. Can carrier screening be customized? Yes. While a comprehensive carrier screen is recommended if you are pregnant or planning for pregnancy, carrier screening with Sema4 can also be customized for your unique family planning needs. For more information, please visit our FAQ page. Have more questions about Sema4 Expanded Carrier Screen?